In today’s world, things change quickly. For rental property owners, this is no exception. Instability in the real estate market and an economic downturn has led to an increase in rental applicants. The good news is that rent prices are up. However, the old rules – like evaluating applicants based only on credit scores, or turning down applicants with little or no credit bureau history — may not be enough to keep income stable. Landlords making yes-no decisions based on a small set of factors, like credit history or bankruptcy, may be missing out on high quality tenants. 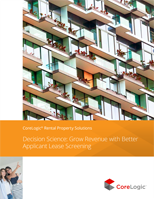 For property owners, greater insight and data allows landlords to make an informed decision about potential tenants.